See if you can notice something familiar? ♦ NBC: “A senior U.S. intelligence official with direct knowledge confirmed to NBC News that the report on Russian hacking delivered to President Obama Thursday says that U.S. intelligence picked up senior Russian officials celebrating Donald Trump’s win. FLASHBACK: […] In essence, the MSM takes a politically manipulated original intelligence claim and pushes a political media angle within a manufactured story of their own creation. When the media reports on their own media reports the concentric circle of a self fulfilling narrative expands toward the infinite horizon of nothingness. Reminder: ♠ The Washington Post is the MSM media outlet for the CIA. ♦ CNN is the MSM media outlet for the U.S. State Department. ♣ Bloomberg is the MSM media outlet specializing in the Mamet Principle, and gaslighting…. and ♦ AP / Reuters / NBC and Alphabets are typical leftist MSM. This entry was posted in Conspiracy ?, Decepticons, Dem Hypocrisy, Desperately Seeking Hillary, Donald Trump, Donald Trump Transition, Election 2016, media bias, Notorious Liars, NSA, Political correctness/cultural marxism, Professional Idiots, propaganda. Bookmark the permalink. The Russians’ celebrated a Trump victory – so what! So did I .. Salute comrades !! Keep brewing my favorite vodka, Stolichnaya !! Oh! That reminds me! Scott Dworkin, a member of #TheResistance, assigned to the #TrumpLeaks has proudly proclaimed to find the smoking gun Trump-Putin connection, Trump Vodka! Oh dear. Is that Pepe I see in that bottom right pic? Dang right…..The Russians are just like everyone else. They do not wish to be ruled by insane liberal globalists who want to take over the world. They want to remain a sovereign country…..
Conversely, the Russians celebrated Hillary LOSING! Turmp winning = Hillary losing. Lou Dobbs gave it right back to Ralph Peters tonight. Those aren’t boos you are hearing, folks. That’s the crowd shouting “Lou! Lou! Lou!”. That was pretty epic, Peters look like he was sitting on a hornets nest. Peter’s is vehemently anti-Russian. He should be disqualified to discuss Russia as he can’t be balanced, even when it’s clear that this is all propaganda from Obama to smear Putin. Kasparov is the same way, when he talks about Putin his eyes get crazy and his lips snarl and little bits of spit fly out. He might be a smart guy but on that subject he is not rational. It’s sick how anti-Russia Peters is. He must be getting paid to say this crap just like Doug Schoen. Ralph Peters is a clown. Always has been. You want a warmonger? .. Ralph Peters is your man. Nothing would please him more than to be in a full scale world war. However, disappointing was Ralph Peters on O’Reilly last night .. O’Reilly is right there with Peters on this whole Russia thing. O’Reilly is just as much a warmonger as Peters. It was a disgusting display of crap and I had to turn it off. I don’t watch O’Reilly very often, and last night was a perfect example of why. O’Reilly is a liberal idiot (emphasis on idiot). I was right there with you, squid .. I cannot tolerate Ralph Peters and his whiny, squealy voice insisting that he knows all. I do not know why he continues to get on these shows, but the difference between Lou Dobbs’ reaction and immediately thereafter O’Reilly was dramatic, wasn’t it? Peters has become deranged or should I say more deranged. He’s never convinced me of anything. Hellary And Obo were spouting off Russia this garbage months ago so I don’t believe any of it now.. Trump needs to do a private meeting with Putin. Invite him to the Patriots playoff game or one this weekend. Treat him like a guest of honor. Putin should invite Obama to a farewell State Dinner. Better yet. If Trump wants to squelch this whole “Russia did it” thing, he should invite Putin to the White House on Jan. 30th for a news conference. Meet with Putin and get Putin to make statements about how our media has been lying about the entire “hacking” crap and have Putin assure Trump and the American public that they had absolutely no involvement in any so-called “hacking” of our elections. Get Putin to recognize that they are thrilled to have Trump as our next President and that Russia will now begin to work with America on a geopolitical scale to help to solve problems of the Middle East, Crimea, Ukraine and the Philippines, and that Russia wishes to work with the United States to foster solutions to benefit all. That would put an end to the whole “Russia dunnit” and put the liberal pukes on their heads. I have been happy certain people have won elections in other countries and disappointed when others I didn’t like won. Guess that makes me a Russian agent. Does anyone here think Obama wasn’t happy as can be when Morsi won or was pissed off when Netanyahu won? And Obama spent $184 MILLION of US taxpayer dollars to directly interfere with Netanyahu’s election. Obama also spent more than $100 MILLION of US taxpayer dollars to directly interfere in the BREXIT elections. He also , as a Senator, campaigned in Kenya for his MUSLIM relative to become Kenyan President. How ture, how true! It’s as if they (these intelligence folk) think any foreign country or leaders ought NEVER have any opinion on the outcome of our elections..and when I think how Obama got involved in Israel’s election and the Brexit election..and who knows how many others…what gall he has to even bring this up as a possibility! So let me get this straight! US officials spied on Russian officials and determined that Russian officials were celebrating Trump being elected and this in part proves that Russia hacked the US election to influence the outcome. How many times shall we run in circles chasing our tails people?It is ok for the US to spy on Russia officials but not ok for Russia to spy on US officials. Somehow this reminds me of underdeveloped brains justifying a bad behavior because someone else did it first. Can we adult now? Yeah. The Russians were happy that somebody who agrees with their Middle-East policy and doesn’t want a war with them, beat somebody who utterly opposes their Middle-East policy and wants a shooting war with them. Oh, man – how sneaky of those Russians to actually believe what they say! Hillary knows this is the double-reverse lie. The absolute sneakiest of lies! I’ve got news for the libtards that will be even worse. AMERICAN TRUMP SUPPORTERS ARE HAPPY THAT THE RUSSIANS ARE HAPPY! Smoke that, Andrea Mitchell! SPOT ON!! … I am not only ecstatic that Russia is happy with our election results, I trust Vladimir Putin more than I do our own “intelligence” community, and certainly more than I trust Obama and his entire administration. I am hopeful that Trump can turn Russia into a strong US ally! .. Russia would be far better off that way, and the US would also stand to gain greatly from such a relationship. Just have to keep Russia from invading its neighbors. If they had good economic and trade incentive to do so, it would not be a stretch to say that Russia would be willing to travel down that road. Just think of the boom to the country of Russia and its neighbors if such a relationship could occur. Exactly! I have often thought how STUPID Obama looks and sounds to be making this big international issue out of the “possibility” that Russia “may” have gotten some information from the DNC (not even a govt. agency!!!) when WE do this …all the time…to the Russians as well as most other countries…without a doubt. This is so dumb! CIA up to their old tricks again I guess. I could not find any such article. Yakov Smirnoff celebrated Trump’s win – therefore Russian hacking! Myself, I must admit I celebrated Trump’s win by dancing on a roof top in Newark. Ah, yes! Anonymous Sources have struck again with MORE fake news! BTW, has anyone else noticed that pretty much ALL the “news” for the last few weeks has been faked using “Anonymous Sources”? Naturally, the beauty of “Anonymous Sources” is that they can be made to say anything you want them to say! Anonymous Sources are the perfect fig leaf for FAKE NEWS! You want to fake some news? Anonymous Sources! You want to counter some fake news with MORE fake news? Anonymous Sources! Heck, is there ANYTHING that Anonymous Sources can’t do? Anonymous Sources is even a great name for a new rock band! Why, Anonymous Sources would even be a great new superhero who could be paired with Captain Obvious! Oh, and if these “leaks” are actually REAL leaks actually from REAL intelligence sources sworn by law to uphold secrecy, then President Trump should fire them, have them prosecuted and jailed if convicted. Might suggest a new group here – Anonymous Sources Speak. It may not be “anonymous sources” entirely, but … anonymous SOROS sources. Say THAT 3 times fast …. Having hacked into Hillary’s home server, with the opportunity for blackmail wouldn’t the russians prefer her as president? The “Russians celebrated Trump’s win” thing isn’t secret. They did so on state television. this is an underappreciated report! Thanks for posting it Marc. Notice that the Russian papers are like ours used to be! The left will do everything to de-legitimize the presidency of Donald Trump. Democrats will blame everyone else (but not themselves) in their loss in Nov 2016 elections. And I hope they keep it up .. they are obliterating the Democrat party for generations to come. They have made themselves look so bad that a lot of Democrat constituents are defecting and don’t want to be associated with these assclowns. Keep it up Dem’s !! .. won’t be long and you won’t have any party left !!! DHS provided us with 876 IP addresses as part of the package of indicators of compromise. Lets look at where they are located. It is well known that US Intel is the majority owner of Tor exit nodes in the world and they monitor the traffic that goes through these nodes constantly. The amount of IP’s that are associated with Tor exit nodes sticks out like a sore thumb. It have been speculated in a number of tech blogs and forums that there is a strong possibility that the NSA or a contractor of NSA was/is involved in these “hacks”. The Tor exit nodes do seem to lend some credit to this hypothesis. The only thing tying this to the Russian’s are some old outdated malicious code. The PHP malware sample they [DHS and DNI] have provided appears to be P.A.S. version 3.1.0 which is commonly available and the website that claims to have authored it says they are Ukrainian. It is also several versions behind the most current version of P.A.S which is 4.1.1b. One might reasonably expect Russian intelligence operatives to develop their own tools or at least use current malicious tools from outside sources. My belief is that this entire report has been created to appear, to any laymen, as if Russia is the culprit just for plausible deniability. If there is any truth in the report re: the code and IP’s, I tend to lean towards an inside actor (US based) or a pretty creative hacking group that is doing this all the time to sell info on the deep web black market. There is also the very real possibility that this is a completely made up report designed by CIA/NSA black hats as a psyop to feed into the already established narrative that was seeded well before the election. this follow up has a section where they talk about the Vermont utility that reported having at least part of the malicious code on a laptop not connected to the grid. Great work by the intelligence agencies. 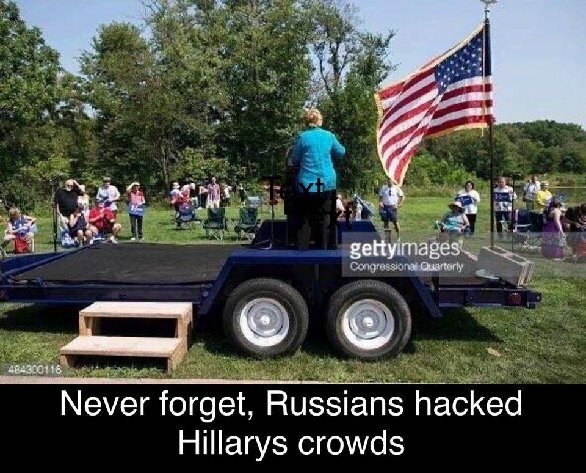 ‘Proof’ that ‘the Russians did it’. They ‘celebrated’ Trump’s win. i as an american celebrated brexit does that mean i hacked the brexit vote???????? EXACTLY!! … and on the other hand, Obama spent more than $100 MILLION of US taxpayer dollars to directly interfere in the BREXIT vote. Glad someone commented about Ralph Peters non-commentary hatred spew against Putin on television. Lou Dobbs needs to find a new talking head as Peters offers no insight on the politicization of intelligence. The current scam is one of the most transparently propagandistic journolist projects of the Obama 8 years. Don’t expect that stuff to end on Jan. 20. But fortunately for us to the extent he can Trump will use the bully pulpit to educate. 14 days to go. Admin — why do all my comments go to moderation? Ralph Peters is an assclown and 100% warmonger. He would love nothing more than to have the US fully engaged in a world war. So celebrating is proof of a crime now? They better get the word out to all the muslims who celebrate when a terrorist attack happens. The entire world should celebrate the defeat of the warmongering criminal Clinton. First this article from Breitbart which reports that most of the information assumed to be provided in the DHS/DNI/FBI report about the hack is supplied by a cyber-security contracting firm, CrowdStrike, which has direct ties to Google. The CNN report also affirmed that the FBI relied on CrowdStrike’s findings. According to the Esquire story, Alperovitch was surprised when the DNC, which had contracted CrowdStrike for cybersecurity, wanted to go public about the alleged Russia hack, which took place at around the same time Donald Trump was being accused of having a relationship with Russia. He has an update at the top that references Guccifer 2.0’s WordPress site where they claim responsibility for the hack and published some of the documents obtained from the DNC – Alperovitch said they were looking into the claims. No where in the blog post does CrowdStrike provide proof of the intrusion being the work of Cozy Bear and/or Fancy Bear – the code words for the FSB and GRU units. They provide IOC’s (Indicators of Compromise), but do not show how it attributes these indicators directly to these 2 units. This is apparently what the FBI sourced for it’s claim that the Russian’s did it in it’s report cited in the DHS/DNI report…. it seems that they (CrowdStrike) have an obsession with these 2 cyberwar characters. Or that they are used to push cyber-security disinformation. So now the mere existence of a celebration is enough to label someone as having controlled the outcome? Aside from the circular reporting going on, THIS is extremely asinine! While he was a US Senator OBOZO personally campaigned for his relative a MUSLIM candidate in Kenya he also used US Govt money and personnel to INTERFERED in Israels elections.